As you may or may not know, I am employed by a hospital as an athletic trainer, and part of my duties include being outsourced to the high school I mention frequently. The other part of my job is to serve the hospital in whatever fashion they think I can be of help. Usually it is rehab or sports enhancement for sports-related injuries, however in the future it will be more specific to concussions. The hospital I work for is opening a Regional Concussion Center to serve the community with concussion information and help, including rehabilitation for head injuries. It took about 2 years of work to get this program started, but with the help from some great people like our medical director, rehab director, and fellow athletic trainers, we will be rolling out soon. Along with new job responsibilities will come new goals and new adventures, one of which is raising the awareness and offering education of concussions. 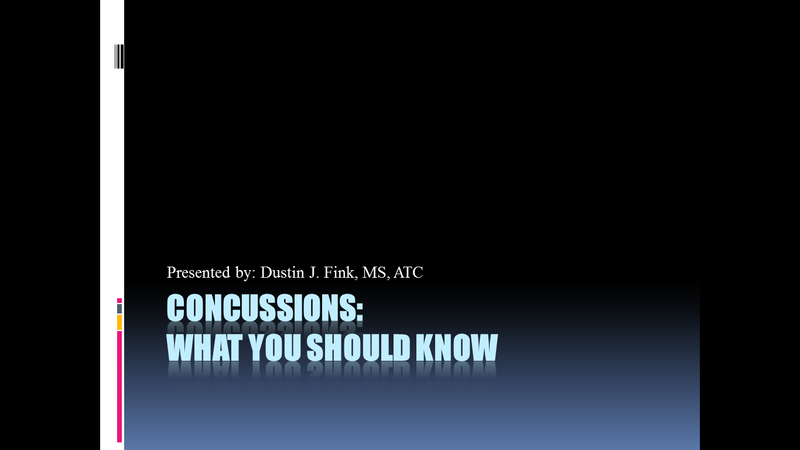 It will be our first priority to educate as many people as possible about concussions and their lasting effects. Getting in front of teachers, coaches, parents, administrators, kids and the community is the push. Today is our first presentation, and as evidenced by the timing of it all, the area is primed to know more and learn how they can help. I will give a presentation today to a local school’s teachers and staff, focusing on the return-to-school aspect. I must say that I am excited about this journey and have no issues with speaking in public, and with a great medical director along side of me, it will be a great opportunity to begin the Regional Concussion Center. That being said, I am willing to travel to speak as well and look forward to the challenges that are presented along the way. Part of the strategy of safe return from concussion is to get clearance from an MD/DO, but that can be used against us as athletic trainers as well. One of our concussed kids has been out for about a week, and was still complaining of symptoms as of four days ago. This individual was ImPACT tested after symptoms were gone for 72 hours, and they did not meet the baseline numbers, which was not acceptable to them or their support system. At first they presented a note from a DC (chiropractor) saying they were cleared, which our school pretty much laughed at (it never got to me as our administrator has been in the know from day one-proud of them). Then I was asked about clearance from the support system and they wanted to know what kind of a doctor they needed a note from, and I told them. I knew where they were going with it and gave the ImPACT results to them to present to the doctor (which would be like Greek to most that have no clue as to what the tool is used for) and placed my name and phone number on there for a consult with the MD about this injury. This player was not ready, period. Sure, they reported no symptoms, but indications from friends and peers was that it was not the whole truth. The ImPACT test backed those reports and my feelings of being around this individual on a daily basis were justified. Part of being a school athletic trainer is knowing the athlete, and we as a group of coaches, teachers, administrators and athletic trainer do a dang good job at it. The next day, I received a signed note from a MD saying they are cleared to return without restrictions. As chronicled before, we as athletic trainers defer to MD notes, and in rare cases will we go out on a limb and challenge them. This is one I have chosen to question. The pressure from the support system (family) is immense and troubling, but with the coaches and administration on ‘our’ side, it is a battle I believe we can win. The only thing I can do is watch carefully and find out any reports from her support group, including friends, and pray that nothing will happen but a safe return for them. This brings us back to EDUCATION AND AWARENESS. Even the medical community needs to be aware of what is happening. Concussions and TBI treatment is very dynamic, and General Practitioners/ER doctors are sometimes very slow to adopt new changes. With the new Regional Concussion Center and our pledge to get information out, it is our hope that everyone will know how to handle these issues, sooner rather than later. We cannot fix your brain if it gets damaged – you only get one of them.